When it comes to office wear, you definitely prefer to get it right first time. First impressions certainly count, and looking too casual can make you seem less formal, whereas looking overly formal can risk making you seem too done up for the office altogether. Therefore, it’s important to strike the right balance between smart and comfortable, in order to look and feel the best you can while at work. In terms of shoes for the office, there are many different options you can consider. Flat shoes, heeled shoes, sneakers to boots, the options really are endless. With such a wide variety of choices available on the market, you may be feeling a little stressed before you even hit the shops, not knowing what’s appropriate to wear in the workplace and what’s not. No need to worry, in this article we will share some expert shopping tips to help you make the best decision next time you go looking for a pair of office shoes. We will share what to look for in office footwear as well as what is appropriate and what is not. Finally, to finish off our office shoe haul, we will take a look at 8 of the best office shoes which will give you a better idea of what to look out for in the shops or online. This will include both men and women’s shoe options, in order for everyone to find something suitable. Office wear, in general, is quite formal. With this in mind, you’ll want to look for shoes that aren’t too casual, yet not too party like – there is a difference. The following factors can be things that will help you find the perfect pair. Comfort in the office is key. With so much going on throughout the day, and in some cases being on our feet most of the time, your feet must be comfortable and not ever be in any sort of pain. You will, therefore, want to invest in a pair of office shoes which are kind on your soles, perhaps with padding or soft insoles which will guarantee stress-free feet. You want to make sure your work shoes are matching with the current season. For men, office shoes are mostly closed and not as open as women’s shoes, yet they should still purchase a pair that will last throughout the Winter as well as Summer, or buy a pair suited to both. For women, a shoe which exposes any parts of the foot will be less use during Winter as it will be too cold, whereas in the Summer it might be easier to wear. It’s just a matter of common sense, but if you want your shoes to last through the seasons, then a closed shoe will be preferred. When it comes to work shoes, you may be better off investing in more than one pair since you’ll be wearing them every day. Having only one pair they will start to get worn out faster. In the case of having important meetings to attend, you may even desire a slicker pair, so having a few pairs of smart looking shoes will allow you to pick and choose to suit your specific day or event. What is Appropriate Office Footwear? There is a fine line when it comes to what is considered appropriate office attire and what is not. For both men and women, a smart shoe is one which has a nice design and gives off the image of a confident, well-put-together individual. An example could be the classic Oxford style shoes for men and usually stiletto heels for women. When it comes to the Summer months, offices can quickly become quite warm. This is when the dilemma of open-toed shoes arrives, and the question of to wear or not to wear comes into play. Every organization is different, but in some cases, an open toe shoe may be forbidden, but in others not. A style that is more likely not to be office appropriate is sneakers such as the Converse- or Nike-style of a shoe. If you are working in a startup company, however, this may not be the case for employees there. In most formal offices around the world, however, the smarter the shoe, the better. Next, we will take a look at 8 different pairs of office shoes that are currently popular on the market. Hopefully, this will give you a better idea of what to look out for when you go shoe shopping! A quality and reputable brand, Clarks shoes offer a fine selection of men’s shoes when it comes to office wear and their Free Slip-On Loafer is definitely no exception. Below we take a look at their key features in a little more detail. Clarks have been making men’s shoes for over 100 years, and certainly deliver in terms of quality and craftsmanship. Their Tilden free shoes are a perfect option for everyday use at the office due to their sleek and smart appearance. You will feel confident walking in these shoes, which provide utmost comfort all day long. The best thing about these shoes is their simple slip-on design, yet they look so smart. No laces to be seen here, meaning your feet are freer from any constraint, and can easily be slipped on and off with no effort making them a popular staple in your work wardrobe. Clark’s Tilden Free shoes have been designed with comfort in mind. They feature breathable material in their design which allows the foot to not become too overheated at the oast a removable Ortholite footbed which gives the foot an extra cushion to walk on. A supportive steel shank is also included in the shoe, which promotes a more stable stance, and a strop grip on the sole helps to prevent slipping. The Oxford-style shoe is the classic work shoe many think of when it comes to men’s workwear. Rockport offers a smartly designed Oxford, with a beautiful leather finish. We look at this shoe in more detail below. If you are looking for a stylish Oxford style shoe for work, then Rockport have a good option for you. Their Apron Toe shoe comes in 4 different colors, including black, truffle tan, tan and finally tan li. Therefore, if you are looking to invest in more than one pair of the same shoe, at least you can have it in a couple of different colors. These shoes are perfect to be worn to work every day of the week. Thanks to their classic, smart appearance, they are a fantastic pair of shoes to keep you going 7 days a week. The best thing about these Oxfords is their weight. Usually, people can expect a pair of Oxford shoes to be quite heavy due to the strong materials used to make them. Rockport’s Apron-Toe design, however, features breathable material which is super lightweight, allowing you to feel like you are walking on air. This material is also sweat-resistant at the same time, allowing your feet to stay fresher for longer throughout your working day – which is definitely a plus. If you are looking for a really smart shoe which is still comfortable at the same time, then the Bruno Marc Moda Oxford shoes will do you proud. These come in a range of different colors, in various shades of brown, black and grey, so you are certain to find something to suit you. They feature an Italian flair and are perfect for office wear. Dream Pairs have certainly created a dream shoe here with their modern Oxford shoe. These are flexible in design, featuring a latex cushioned footbed, allowing your feet to truly get the most out of the shoe. No longer do you need to worry about your shoes feeling too tight, as these feature premium faux leather lining, that allows the feet to have some extra added comfort while you walk. These Oxfords feature such a slick design, making them perfect for either the average office day or even a formal event such as a wedding or ceremony. You really can’t go wrong with these shoes. The quality of the shoes has been questioned by a few customers, some saying they weren’t as quality designed as expected. Deer Stag have been producing classic, comfortable men’s shoes since 1929, and continue to do so today. Their Greenpoint Slip-On loafer is one of their most popular shoes as it was built to last, and is perfect for everyday wear. These shoes are extremely lightweight and at the same time durable. Many times when purchasing a light pair of shoes, you may be discouraged thinking that they won’t last as long. With a pair of Deer Stag’s shoes however, you don’t need to worry as they are specially designed to be durable and feature a strong grip and slip-resistant soles which will deal with all kinds of terrain. There is nothing better than putting your feet into a fresh pair of shoes, to find that they have extra cushioning inside. Being out and about on your feet all day, you will need a pair of shoes you can trust, and that will keep your feet from rubbing. The Greenpoint shoes feature extra padding throughout in comparison to other traditional loafers. A little padding certainly goes a long way. Unlike most leather shoes, you can be assured that this product is cruelty-free and is made of a completely synthetic material, featuring absolutely no animal leather. If you are careful of what you buy, then this may be a good option to go for. 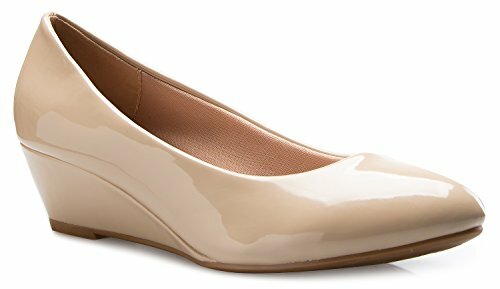 The first pair of women’s office friendly shoes on our list are the round toe wedge’s by Olivia K. If you are looking for a more defined shoe which is the perfect mix of classy and casual, then these are a good option worth considering. Let’s take a look at them in a little more detail. A few customers complained that the sizes were off and felt the fit was a little bit disappointing. Olivia K provide a fantastic low wedge heel which is bound to become a firm office wear favorite. These shoes are not too high with a heel of only 1.75” meaning they will still give you that bit of height without any of the pain to go with it! Wearing heels of any size, whether they are high or low can still put some women off due to the pain they sometimes bring to their feet. With these round-toe wedges, however, they are designed with a soft cushioned sole which gives the wedge a super relaxed fit, meaning you can strut your stuff without any worries about blisters occurring. The best thing about these wedges is not only can they be worn at the office, but thanks to their classic, sleek feminine style, they can easily be paired up with a nice dress and worn to any occasion, be it a night out with friends or even a more formal event. The option of 9 different colors also allows you to better match your shoes to your work uniform, and perhaps gives you the chance to order more than one color. The problem with many women’s shoes, especially heels is that they almost always come in narrow styles which are only well suited to those with narrow feet. With the Olivia K wedge, they are specifically designed to fit those with a wider foot, which means they will fit a lot more comfortably than your average pair of pumps from the store. Comfortable wedges are every woman’s desire, and comfy wedges which come at an inexpensive price are even more of a luxury. Guilty Heart have a wonderful pair incorporating both of these factors, and which are perfect for everyday office use. Let’s explore their features a little further. More than one customer has complained that the heel has come away from the sole not too long into ownership. If you like to wear heels but afraid of the effects they bring, then a wedge is the next best thing to go for. Guilty Shoes have excelled with their classic office wedge by designing a pump so comfortable, it is perfect for wearing every single day without burning your feet out. Women who like to opt for a more feminine look will prefer a heel over a flat when it comes to office shoes, and with this wedged heel they can be guaranteed lasting comfort. The Guilty Heart shoes feature a balancing sole which helps keep the foot stable, which is definitely a benefit when it comes to wearing any sort of heel. The shoes include extra padding to allow for that little bit extra comfort meaning your feet will be able to last for longer periods and keeping you feeling relaxed. The best thing about these wedges is their classic design which is sure to compliment any outfit you decide to wear. Their versatile style means they can even easily be worn outside the office hours whether to staff drinks or even other more formal events and meetings. With 14 colors to choose from you have are sure to find something to suit. With a heel measuring 2.5”, you can be assured that you will not fall when wearing these. In fact, these wedge heels have been designed with a safe and durable sole which will allow you comfort in every step. 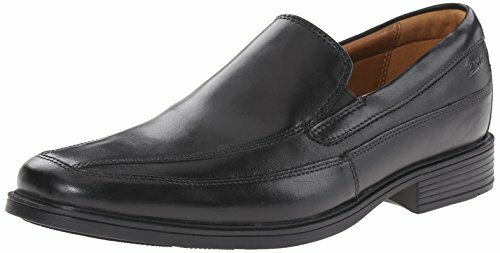 If you prefer a more flat style shoe design when it comes to office wear, then Daily Shoes have a good option for you with their classic flat slip-on loafer. This popular shoe is another perfect option for everyday use and has many comfort benefits. We will discover more about them below. Daily Shoes are experts when it comes to making a statement with your footwear! 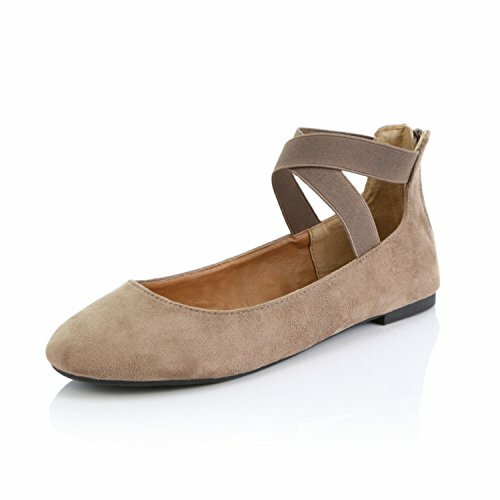 Their ballet flats with elastic straps are the best-suited option if you want an office shoe that is super comfortable. When it comes to work shoes, we definitely want something that is going to last us for a long time. With Daily Shoes ballet flats, you don’t need to worry about them wearing fast as they were built with durability in mind. The elastic straps on the shoe are created with long-lasting material which will allow them to last many years. The soles are full of traction which improve your balance and even help improve your entire posture. With the soft elastic straps and a contoured sole, these ballet flats will have a snug fit on your feet providing just the right amount of comfort and support. Their ultra-soft, faux-suede design means they can be paired with your favorite pair of work trousers or skirt. One of their key features which many women praise is the thick ankle strap, which allows for an even more secure fit, as well as better security on the foot. These thick straps can easily expand to fit a wide variety of sizes and are not constrained to one size only like many standard ballet pumps. A simple zipper on the back of the heel allows for an easy access shoe. The Daily Shoes flats are perfect to match with any outfit, as they come in a variety of stylish colors and patterns, which will make a great new addition to your workwear collection. They will literally go with anything, whether you have a pair of bootleg trousers or even a stylish skirt. Although these heels are advertised as being extra comfortable, a few women complained their fit wasn’t as comfortable as they’d hoped. Jenn Ardor is committed to providing women with essential footwear that lasts a long time. Their exciting range of chic styles never go out of fashion and are definitely designs that will make you feel confident as soon as you put them on. 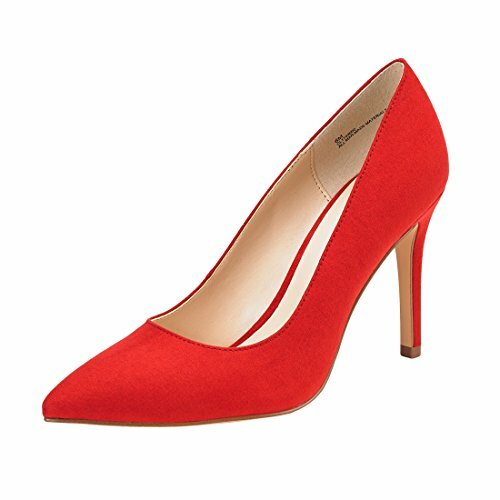 For those women who prefer a classic stiletto look that is always in fashion, then this shoe is the best option to go for. Why? the pointed-toe design makes your heels perfect for both office wear as well as any other occasion, whether going to a party, an interview or a meeting. The heel on the Jenn Ardor shoe measures around 4 inches in height, which gives just the correct amount of lift without causing too much pain on the balls of the foot, which many high heels often do. Say farewell to blistered, red and painful feet caused by heels which are too tight, and say hello to endless days of foot bliss! Thanks to a comfortable padded insole included on the inside of the shoe, you no longer have to worry about needing plasters every 5 minutes. Simply slide on your Jenn Ardor stilettos and you are good to go! All of Jenn Ardor shoes are designed using only the most premium quality synthetic materials. This means no substances derived from animals are used in the making of their shoes, which means you can happily own a pair of shoes that you can trust brought no harm to animals. 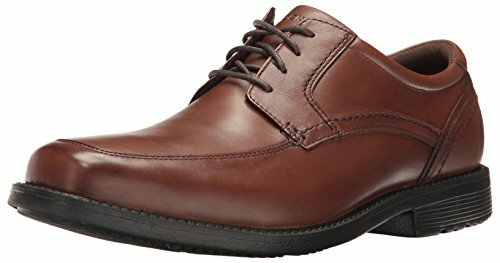 Which are The Best Office Shoes For Me? Choosing the best pair of office shoes largely depends on what factors you have in mind before you go shopping. This could be in terms of a budget, style, fit and even color options. We will share our top picks for you from our list, to make your purchase decisions easier. If you are a male who is shopping on a budget, and looking for the best budget pair of office shoes, then our best bet would have to be Deer Stag’s slip-on Greenpoint loafers. These are the most inexpensive option from all the other men’s shoes and definitely look and provide good value for money. Perhaps you want to improve your style at the office and go for a more upper-class design? Then our best pick in terms of style would be the classic Oxford shoes by Dream Pairs. These features a unique Italian design, and are sure to impress your co-workers. 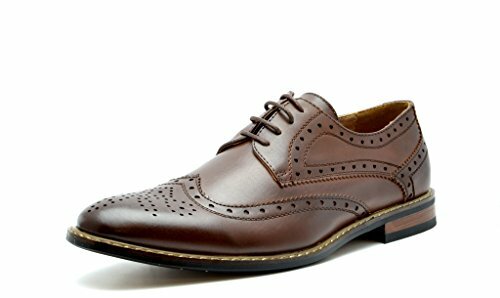 Finally, if you would like a pair of men’s office shoes which are best suited for your comfort alone, then Clarks are the best brand to purchase. They are shoe experts, and when it comes to comfort, you can definitely trust they will provide a durable, comfortable shoe. Clark’s shoes are also well-known to last for a long time so are a good investment for the future. Now looking at women’s office shoes, there are pretty much the same factors to consider when it comes to buying a new pair of office shoes, whether it’s the color, fit, style or budget. We will start with those ladies shopping on a budget. From our list, most, if not all of the options we have chosen are relatively suitable for those who don’t want to break the bank. 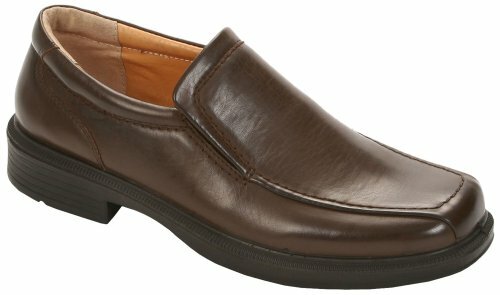 The most inexpensive pair, however, are the flat slip-on loafers by Daily Shoes. These are a popular option and feature an attractive strap design – perfect for everyday use. For those ladies who want complete comfort when it comes to workwear, then the best option is probably Olivia K’s close round toe wedge. These are favored for their extra padding and snug fit, meaning they are guaranteed to keep your feet happy after a long day at the office. If, however, you are looking for that classic stiletto look with a little bit of a heel, and a desire to keep up with what’s trending, then we certainly recommend (and think you’ll love) the closed toe high stiletto heels by Jenn Ardor. Jenn Ardor is famous for creating stylish, trendy shoes which are sure to turn heads, and these pumps are no exception. When it comes to office attire, comfort is always a key factor which should be kept in mind. No one wants to feel extra strain with their clothing at work, and especially not from their shoes. Therefore, it’s always beneficial to carry out a little research beforehand to find out which shoes are most suited and will work best with your feet. Simply going to purchase a pair of shoes on the same day may give you results, but finding out after wearing them that they are hurting will make you wish you gave it some more thought. Therefore, we hope that this article and guide has been helpful to you and that it will help you too when it comes to finding the perfect pair of shoes for the office. All of the options featured on our list are sure to satisfy your office shoe needs, and should definitely make you feel more confident at work.